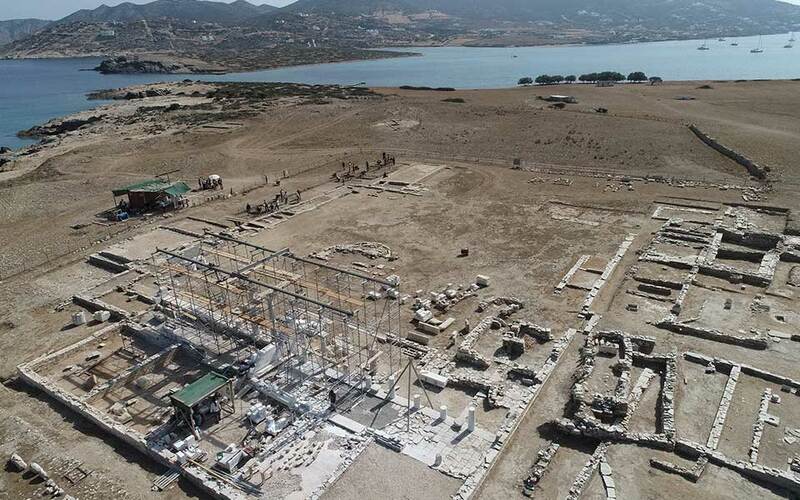 An aerial view of the sanctuary of Apollo on Despotiko island near Antiparos. Painstaking archaeological excavations and restorations are bearing fruit, elevating this once sacred island to its rightful place as a key ancient site. When it comes to ancient sanctuary-islands in the Cyclades, there’s a “new sheriff in town” – Despotiko! We usually think first of Delos, with its sanctuary of the divine twins, Apollo and Artemis; but radiating outward from centrally-located Delos were at least 22 other island shrines also dedicated to Apollo, the foremost among which similarly attracted shiploads of reverent visitors, splendid votive objects and exquisitely crafted marble temples. 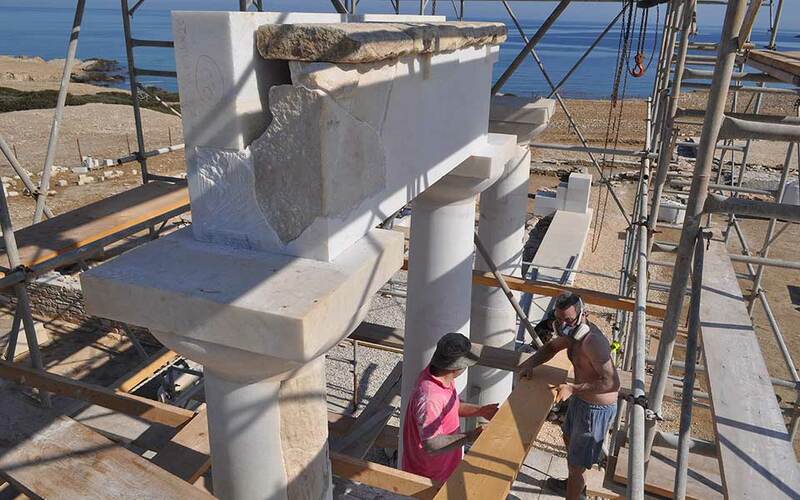 A section of the sanctuary of Apollo on Despotiko has been restored, bringing its onetime grandeur back to life. 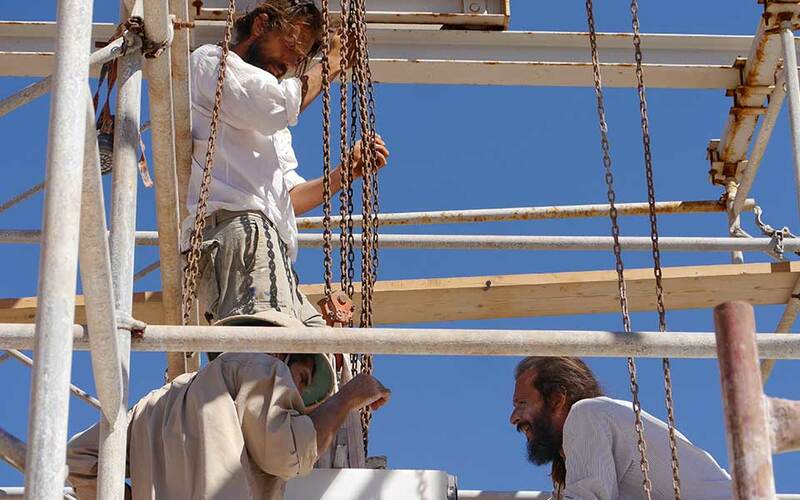 The 2018 field season at Despotiko was only the latest campaign in a twenty-year investigation of the islet by archaeologist Yannos Kourayos and his team. 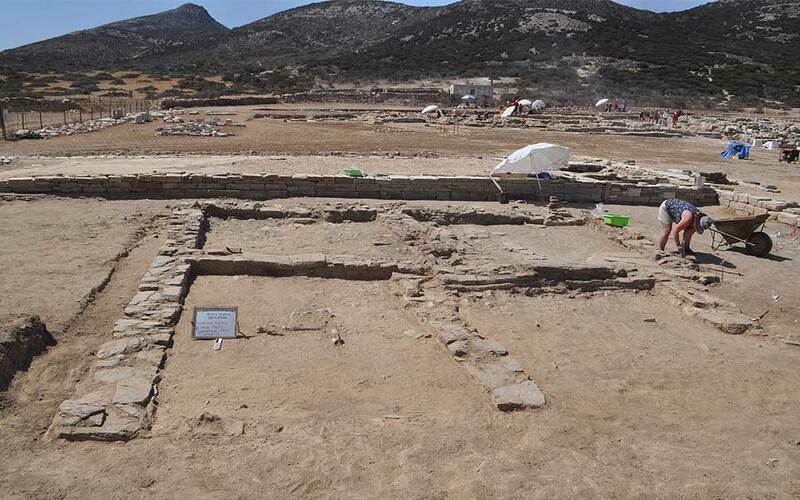 To date more than 200 square meters of the primarily Archaic-era sanctuary have been revealed, while excavators have also probed the tiny islet of Tsimintiri in the strait between Despotiko and Antiparos. The first exploration of Despotiko was undertaken in the 19th century by archaeologist Christos Tsountas, who uncovered Early Cycladic cemeteries. In 1959, Nikos Zafeiropoulos conducted further excavations, in the northeastern areas of Zoumbaria and Mandra, bringing to light the first scattered traces of a Doric-style Archaic temple dating to about 500 BC. Beginning in 1997, however, Kourayos concentrated fresh efforts at Mandra, where he has determined that Despotiko’s sanctuary was first established in the Geometric period (as early as the 9th c. BC), then flourished during Archaic times (6th – 5th c. BC), before finally being destroyed by unknown forces, perhaps the Athenians or marauding pirates, in the late Hellenistic or early Roman era (2nd c. BC). Despotiko appears in the text of the Augustan geographer Strabo under the name “Prepesinthos”. Inscribed Archaic pottery fragments found on the site identify Apollo as the main deity worshiped there, but his sister Artemis, just as at Delos, was also likely revered within the sanctuary. A marble altar inscribed in Greek with “Hestias Isthmias” indicates the presence of another goddess, Hestia of the Isthmus. The isthmus in question may have been a narrow strip of land that originally connected Despotiko to Antiparos (from at least the Bronze Age through Hellenistic times), where now – due to sea-level change – a channel only 1 m deep separates the two islands. 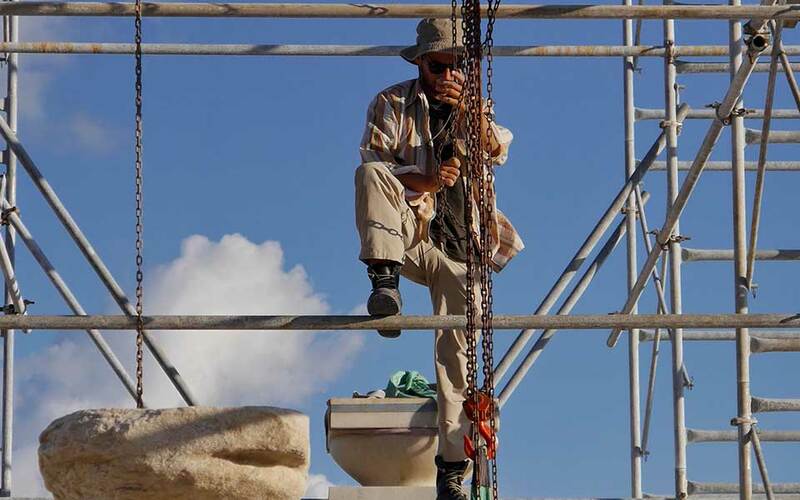 The work to restore the sanctuary is a technically challenging undertaking. 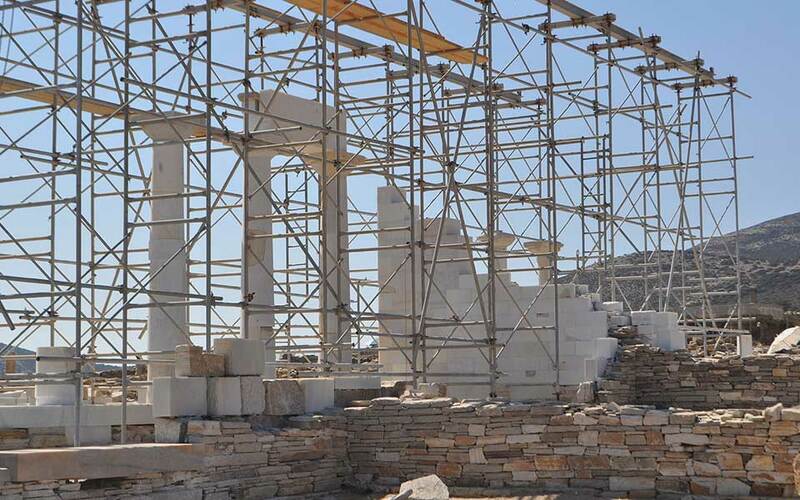 At least eighteen buildings and defined spaces have so far been revealed on Despotiko and Tsimintiri islands. Those at Mandra include the main Apollo temple, an adjacent stoa (a long, covered portico with rooms behind) for ceremonial dining, a large courtyard, a group of buildings called the East Complex, and numerous other auxiliary structures that surrounded the core area of worship – all dating originally to the Archaic era. The scale of the ruins, with two well-preserved facades and some of the ashlar-built walls extending as much as 35 m in length and still reaching 1.7 m in height, provides clues to the sanctuary’s original monumental appearance. Another long, possible fortification wall has been recorded stretching between the sanctuary and the coast, where its port once stood. The long lifespan and popularity of the Despotiko sanctuary meant that its buildings needed to be rebuilt several times during the Archaic period. Early finds, many discovered below the uppermost floors, have included Proto-Corinthian and Corinthian “aryballoi” (small oil/ointment containers), some of which represent animals (roosters, hares); clay figurines; various glazed ceramic objects and statuettes; signet rings featuring semi-precious stones; bronze and ivory clasps in figure-eight shapes; an ostrich egg; stone, glass and gold beads; and bronze, silver, lead and iron objects, including swords, domestic implements and many agricultural tools. The rich array of artifacts from the sanctuary’s Archaic and Classical phases also includes ceramic vases, basins, bottles, lamps, pots and amphorae, as well as fragments of marble Kouros statues and other sculptures; gold and bronze jewelry; faience scarabs; and a striking clay statuette depicting a goddess (ca. 650 BC). This abundant material record shows that Despotiko was a maritime crossroads, to which visitors and goods came from mainland Greece, other Aegean islands, the Ionian, Rhodes, Cyprus and Egypt. Kourayos suggests the sanctuary, originally built by the Parians in their competition for Aegean dominance with the Naxians, came to be well-known throughout the Greek world and may have been larger even than that on Delos. Following the destruction of its sanctuary, Despotiko subsided into peaceful abandonment, marked only by a brief medieval occupation in the Frankish era and the solitary activities of a contemporary goat herder who established his hut and animal pens directly on top of the ancient site. 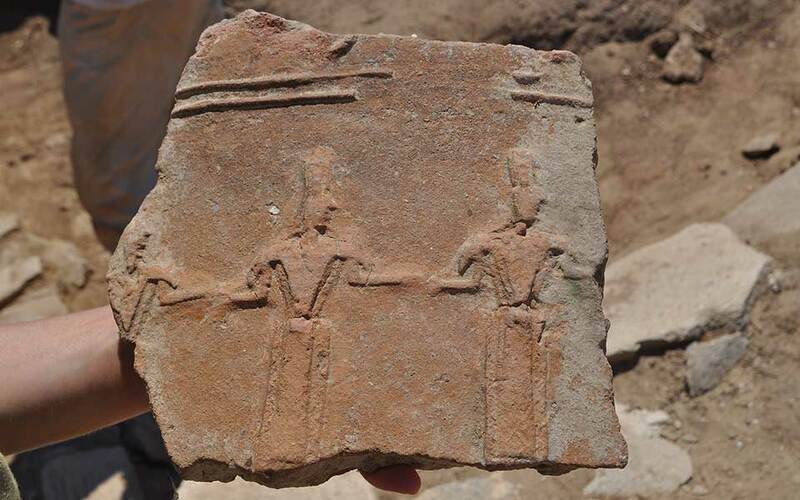 The archaeologists’ dismantling of modern structures and enclosure walls, built using fragments from the sanctuary, has revealed a plethora of ancient architectural members including column drums, capitals, triglyphs and sections of cornices. Despotiko today is a tranquil, unspoiled island where nature and history coexist. Restoration of the sanctuary, particularly of the Apollo temple itself, where three Doric columns have now been re-erected, has given the ancient site’s low field of ruins a third dimension, as visitors’ eyes now follow the graceful marble temple’s lines skyward. Despotiko offers the public an open-air museum, while some of its archaeological artifacts can be viewed in the museum of Hora (Parikia) on nearby Paros. 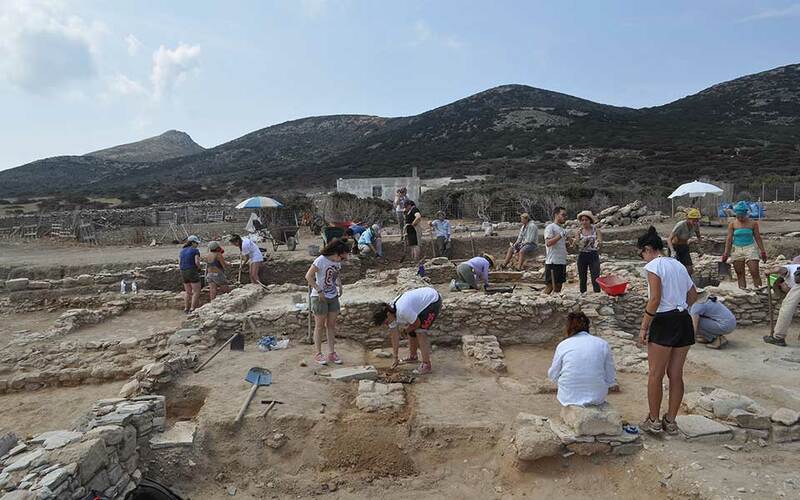 Archaeological and restoration works continue on Despotiko, thanks to the generous support of numerous private citizens, and grants from the Ministry for the Aegean and the Latsis, A. Leventis and Kanellopoulos foundations. 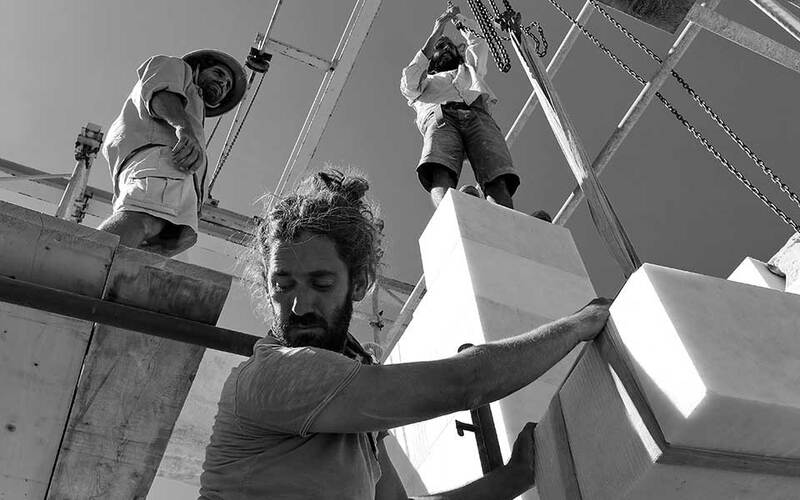 An image from the exhibition "The People of Despotiko"
To celebrate the achievements of Despotiko’s archaeological excavations, now in their twentieth year, led by Yannos Kourayos of the Cycladic Ephorate of Antiquities, several presentations have recently been organized, or are about to take place. In Athens, on January 27, Kourayos’ new book on the excavations and restoration of the site, “Despotiko: A Journey In Time” (published by the Municipality of Antiparos, 2018; Greek and English; 18 euros), was presented at the Old Parliament House by archaeologist Petros Themelis, accompanied by the Mayor of Antiparos, Tasos Pharoupos. Kourayos gave the audience an illustrated lecture on his findings at Despotiko, while actor-musician Spyros Pavlakis offered musical and dramatic entertainment, and fellow thespian Constantinos Constantopoulos recited ancient Greek poems, written appropriately by Archilochus (680 – 645 BC), the renowned Archaic poet of Paros. 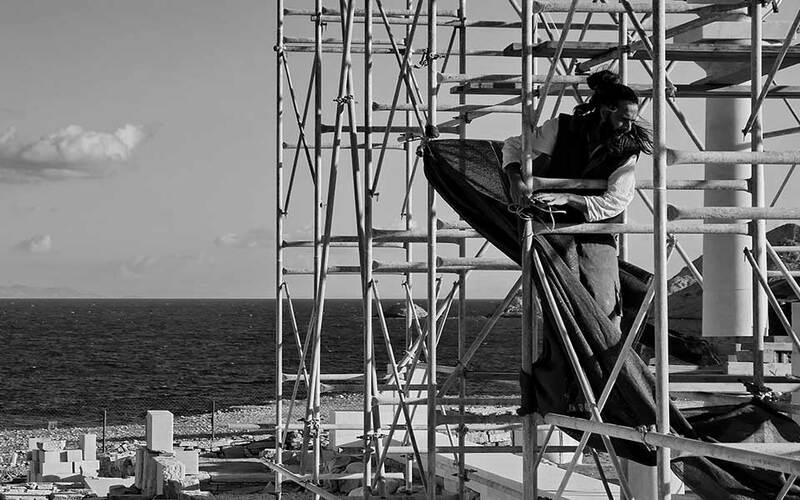 A photographic exhibition has also been organized, by the Hellenic American College, Hellenic American Union and International Association of Photography & Art of Antiparos, entitled “The People of Despotiko.” Presented are photographer Mary Chatzaki’s images of the restoration works at Despotiko and the team of modern-day craftsmen who are re-erecting the ancient sanctuary’s elegant marble temple of Apollo and other structures. The exhibition, to be held in the Hadjikyriakos-Ghikas Gallery of the Hellenic American Union (Massalias 22), will open on February 11 and continue through March 2, 2019 (hours: Monday-Friday, 12:00-21:00; Saturday, 10:30-14:30; closed Sunday; free admission). The exhibition’s opening festivities (7 pm, February 11) will include a keynote address by Dr. Kourayos. After its initial presentation in Athens, “The People of Despotiko” will travel to the United States to be exhibited at the Greek Consulate in New York beginning October 10, 2019. A catalog for the two shows has been prepared by the Melissa Publishing House.